Lily is a truly exceptional bulb flower thanks to its blooming and also thanks to its leafage. Caring for it from planting to keeping the bulbs in winter will help you to have superb lilies year after year. The most desirable season to plant lily is spring, but it can also be done in fall. If the climate is mild in winter, you can also plant it a bit later. Avoid planting your lily bulbs in summer because they would suffer from the heat and lack of water. Choosing the location and the quality of the soil is primordial in planting lily. That’s what determines the blooming and the expected growth of the plant. Lily likes rather rich soil that must drain well. It is a plant for which chalky soil has adverse effects. Full sun exposure is mandatory for blooming. In case of moist clay soil, follow our advice to solve the issue. Proper planting means less follow-up and watering at later dates, so take the time to plant your lily properly. Lily is planted more or less 4 to 6 inches (10 to 15 cm) deep. Space them at least 6 inches (15 cm) apart, in clusters of 4 to 5 bulbs. For your terrace, you can plant them in pots in spring or fall. Potted lily requires great drainage thanks to a hole at the bottom of the pot. Once properly settled in, lily is a plant that has little need for care. From year to year you’ll be falling unreservedly in love with this marvelous flower. Stake the taller varieties to avoid having the stems break or collapse. Eliminate wilted flowers as soon as you notice them, cutting the stem just below the peduncle. If your lily bulbs are properly settled in rich soil that stays cool in summer, you shouldn’t need to intervene too often. Water in case of dry spells or strong heat waves. Fertilizing isn’t always necessary, but can be helpful during the blooming to spur the growing of the lily. Bulb flower fertilizer is perfectly appropriate. In pots, fertilizer is often required starting from the second year you’ve been growing your lily. 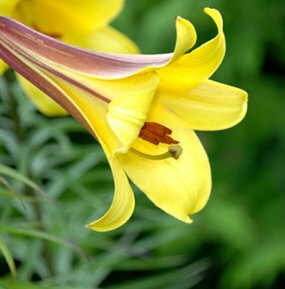 Lilies, like most plants, also fall victim to certain parasites like aphids, slugs or thrips. But the most common and most fearful parasite for lilies is the common lily beetle. 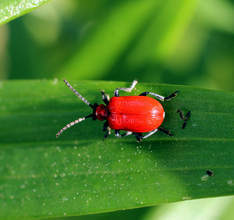 It is a red-bodied beetle with black legs that devours lily leaves and flowers and can cause great damage. As soon as you’ve noticed the first lily leaf beetles, often inspect the leaves to detect their larvae on the underside of leaves. The earlier you spot them, the higher your chance of getting rid of them or of thwarting the invasion. Manually pick the beetles without dropping any to the ground. The lily is the symbol of the Virgin Mary and more generally the symbol of purity. This is most certainly because of its pristine flowers. This plant has a majestic bearing that its colors and various shapes support in any garden. Bunching up like trumpet-filled bouquets, this hardy bulb flower is perfect to ornate flower beds, edges and terraces. It also spreads its fragrance by and far, an inviting odor of delicate lily. 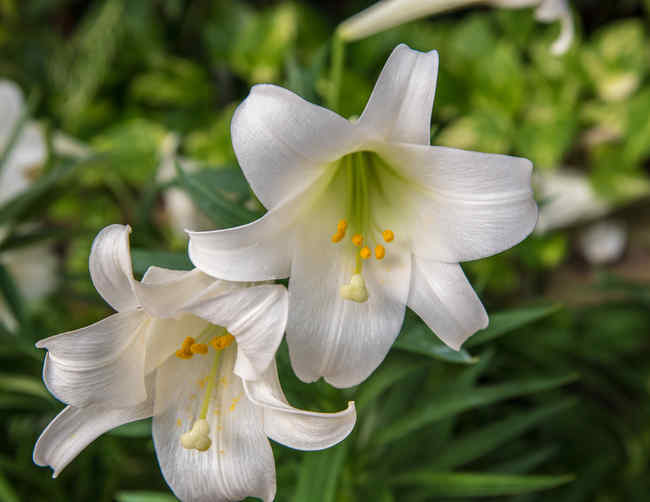 Although most lily varieties are deciduous, Lys candidum is one of the rare evergreen cultivars, and hence keeps its leaves in winter. 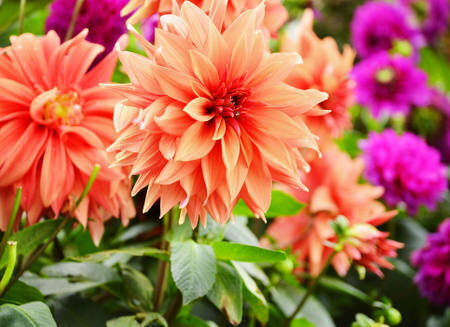 Add special flower-bulb organic fertilizer to make the blooming even more spectacular! Discover the beautiful martagon lily variety.